광학 얼라인먼트 조정을 필요로 하지 않습니다. 대기 시간 없이 On / Off를 즉각적으로 할수 있습니다. 광량 조절은 1 % 단위로 1 ~ 100 % 까지 설정이 가능합니다. 3개의 채널 설정을 통하여 각 채널의 광량을 각각 설정이 가능하며, 간단한 버튼 조작으로 채널 변경이 가능합니다. 구형 모델에 비하여 2배의 강해진 출력으로 샘플을 자극합니다. DAPI, CFP, Aqua, FITC, TRITC, TxRed, Cy5 등의 다양한 형광염색에서 사용됩니다. 예상 수명이 25,000 시간을 초과하는 장시간 수명을 가지고 있기 때문에 소모품 교체 없이 오랜기간 사용이 가능하고, 추가적인 운영 비용없이 안전하고 편리한 조명 시스템입니다. 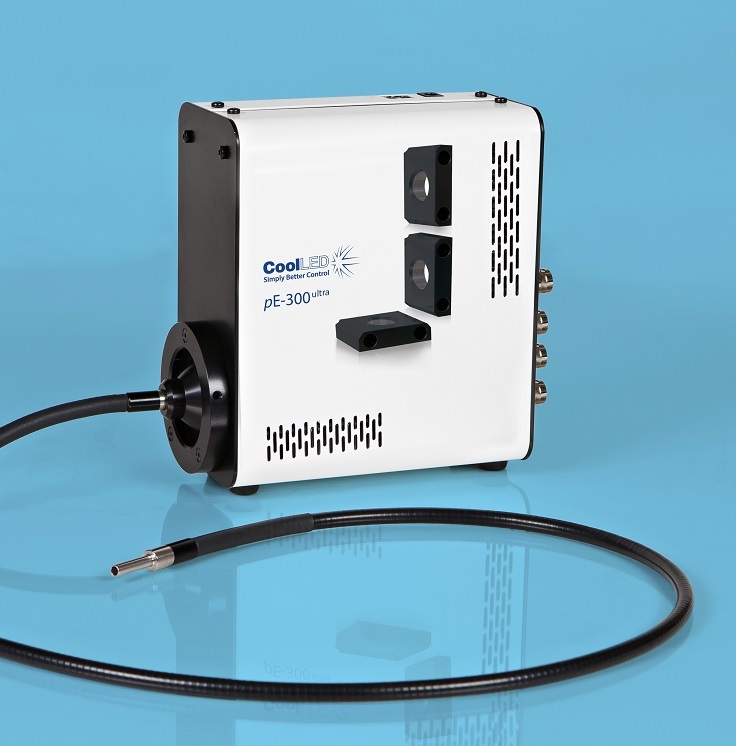 CoolLED’s pE-300ultra is a fluorescence microscopy light source which offers intense, broad-spectrum LED illumination for imaging most common fluorescent stains. 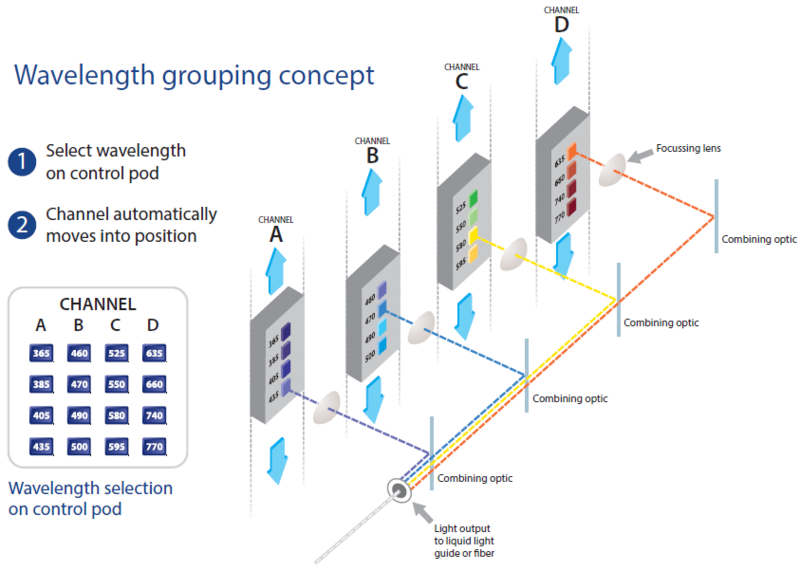 Users have access to both microsecond switching via multiple TTL inputs and the ability to mount inline excitation filters. 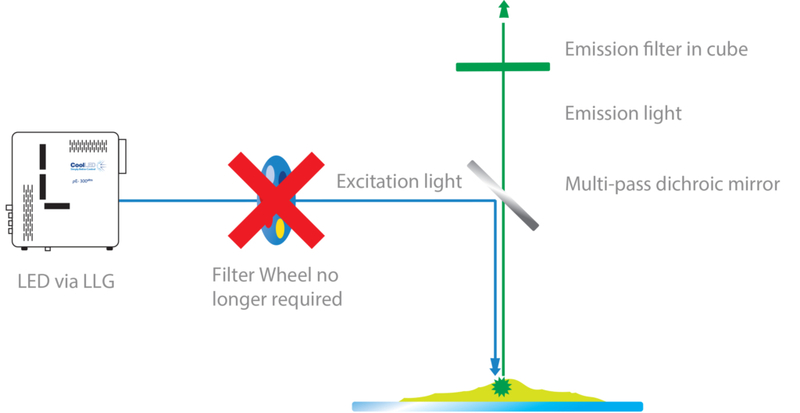 This, when paired with today’s high performance multi band filter sets, facilitates imaging traditionally done via a white light source and a filter wheel, with all the benefits of LED. 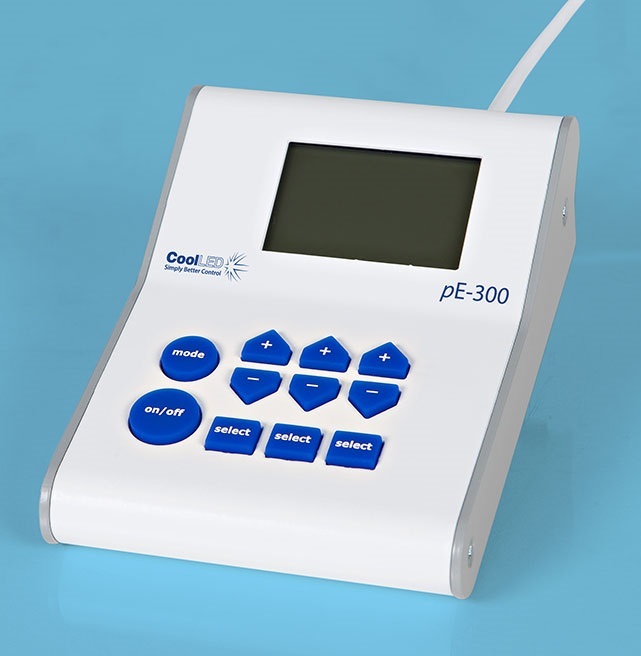 The pE-300ultra is the most controllable member of the pE-300 Series. 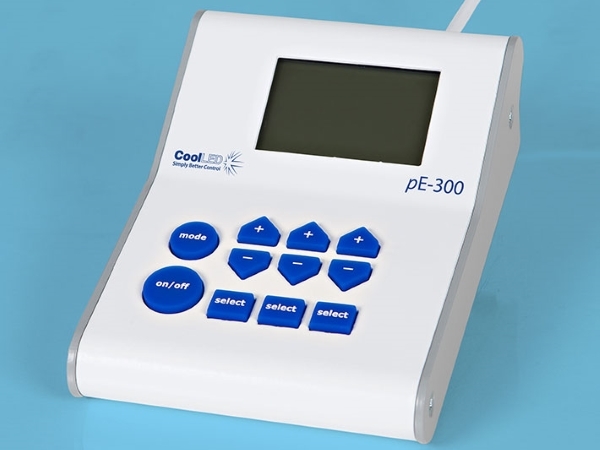 In addition to the many features of the pE-300lite and the pE-300white, the system offers precise control over wavelength intensity and shuttering. 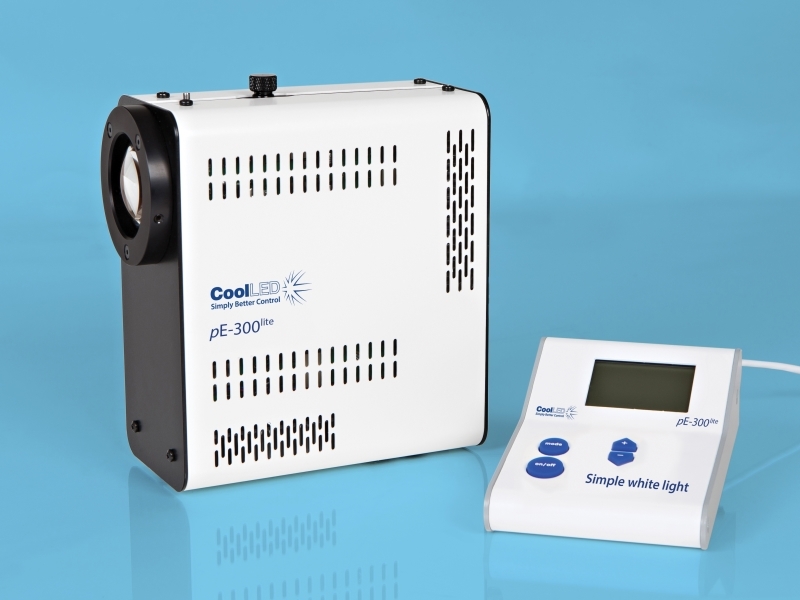 Until now these benefits have only been accessible to users of high end, highly flexible illuminators such as the CoolLED pE-4000. 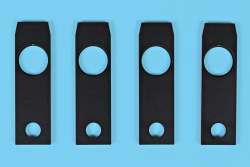 Throughout 2017 we will be releasing exciting new products and product updates. The first member of the CoolLED product range to receive the star treatment is the pE-300 Series. 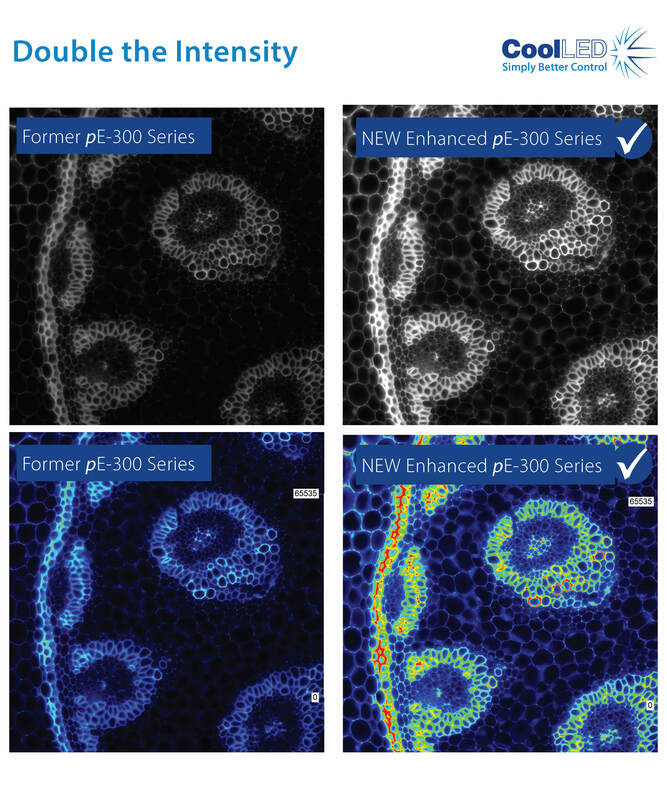 As part of the award winning pE-300 Series, the NEW Enhanced pE-300ultra now delivers DOUBLE the intensity at the microscope sample plane. 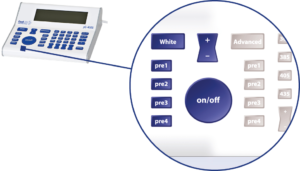 It allows adjustment of output in 1% steps, giving precise control. 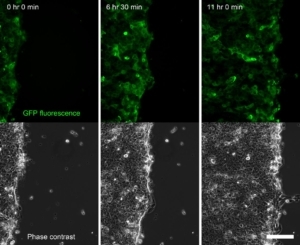 The broad spectrum covers everyday fluorophores: DAPI, CFP, Aqua, FITC, TRITC, TxRed, Cy5 and many more. 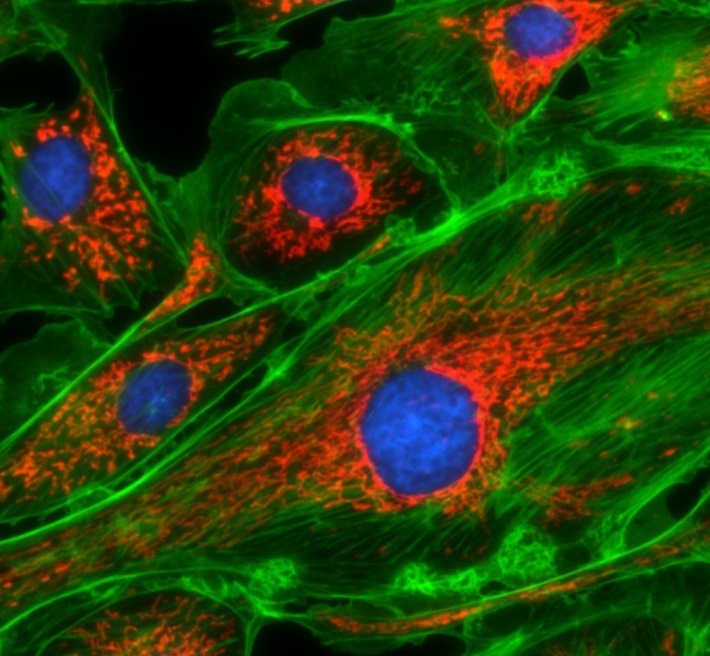 It is now possible to view and image your samples brighter than ever. Convaleria taken with Photometrics Prime camera with 10ms exposure. 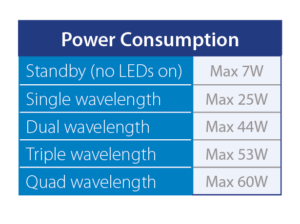 LED illumination means no mercury to dispose of and lower energy costs due to low power consumption and the precise control offered. 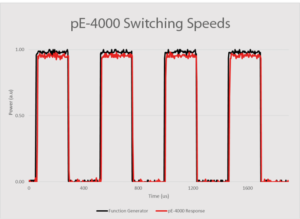 With the new enhanced pE-300ultra, all 3 channels at full power use just 46 Watts. That is almost a quadruple efficiency increase! 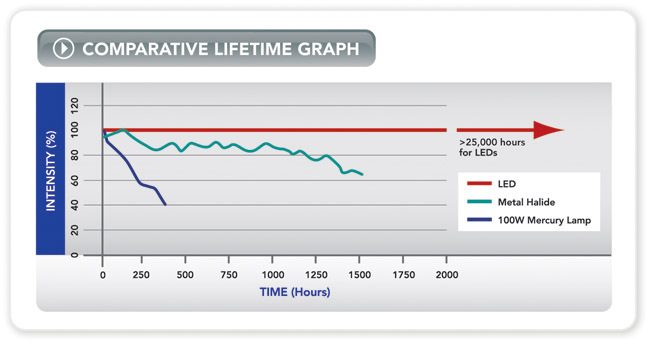 This compares to other LED technology that uses 120 to 350 Watts. 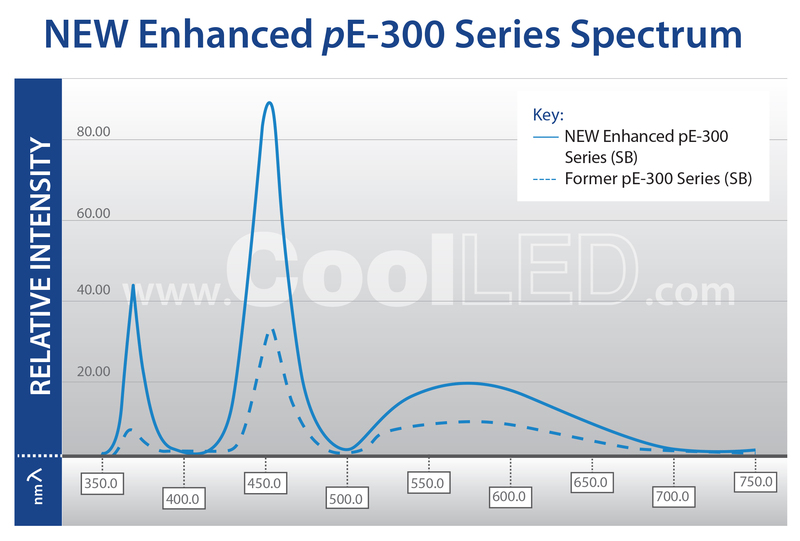 This leap forward in technology makes LEDs more attractive when compared to old Mercury or Metal Halide technology. Where “green” funding is available, the reduction in institutional energy usage improves the return on investment. 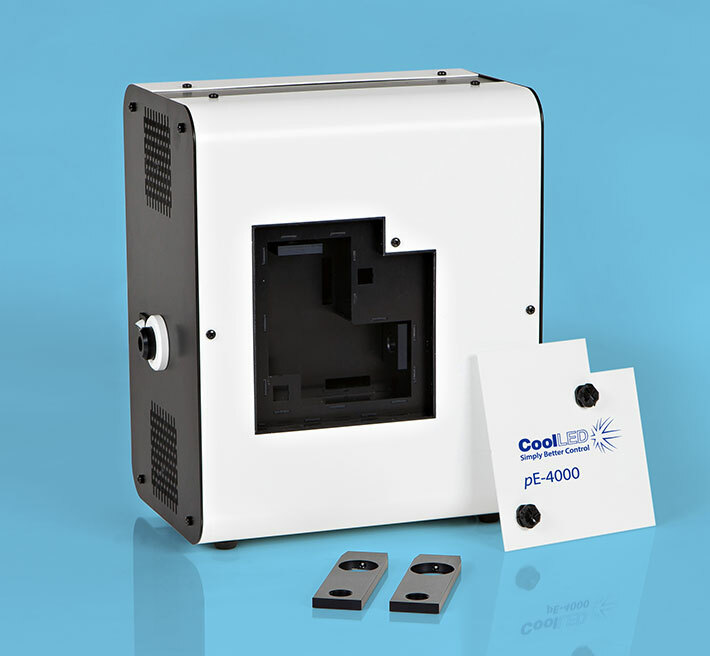 CoolLED’s pE-300 Series was the 2017 winner of the “Go Beyond Award” in the “Products” category for “Excellence in sustainability in laboratory and other high technology facilities” The International Institute for Sustainable Laboratories (I2SL) runs a unique awards program honouring organisations, individuals, products,and projects that are advancing sustainable, high-performance facilities. 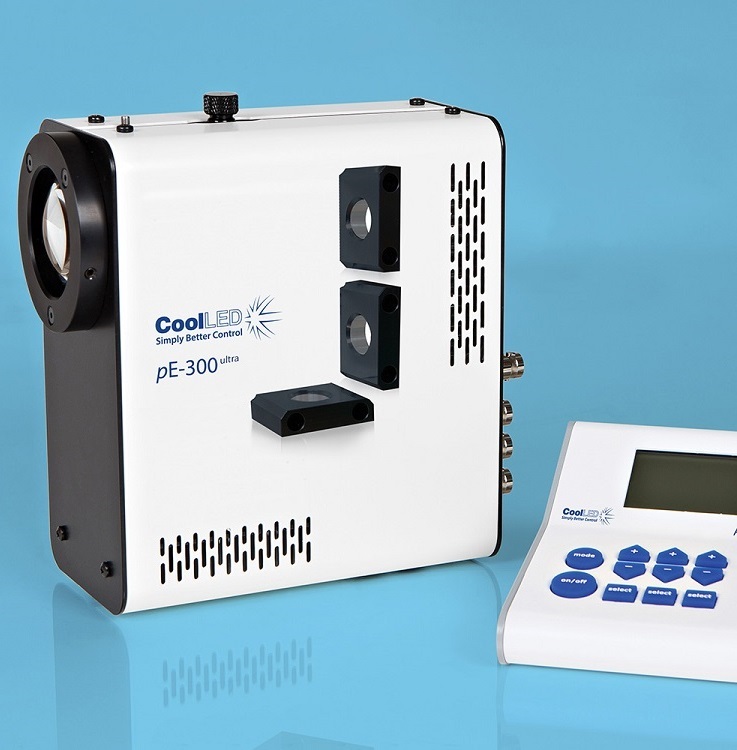 The pE-300ultra offers triggering from multiple TTL inputs which, coupled with the ability to mount inline excitation filters, provides microsecond switching of pre-filtered excitation light. 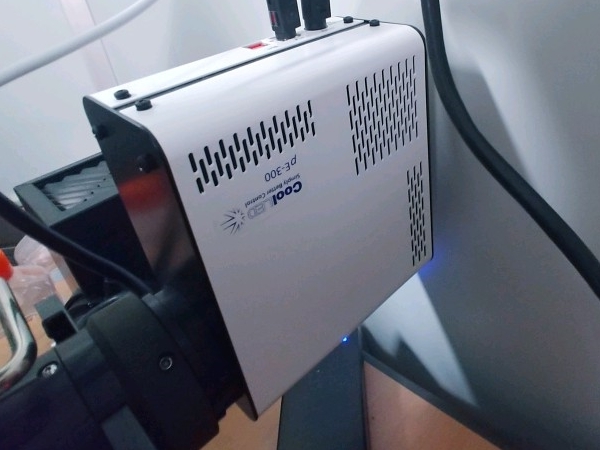 This, when paired with today’s high performance multi-band filter sets, facilitates imaging traditionally done using a white light source and a filter wheel, with all the benefits of LED, and most excitingly at speeds not previously so affordable. 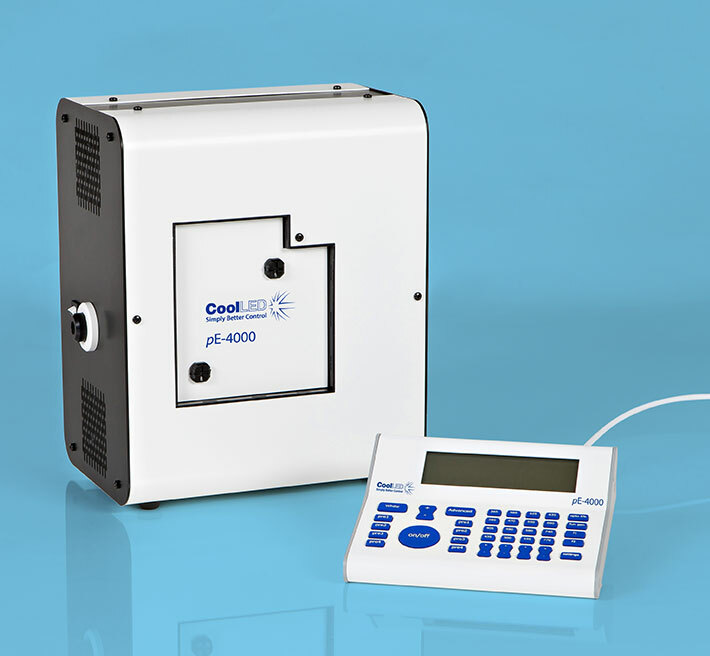 The system comprises a pE-300ultra Light Source, Control Pod, set of three Excitation Filter Holders and Power Supply. 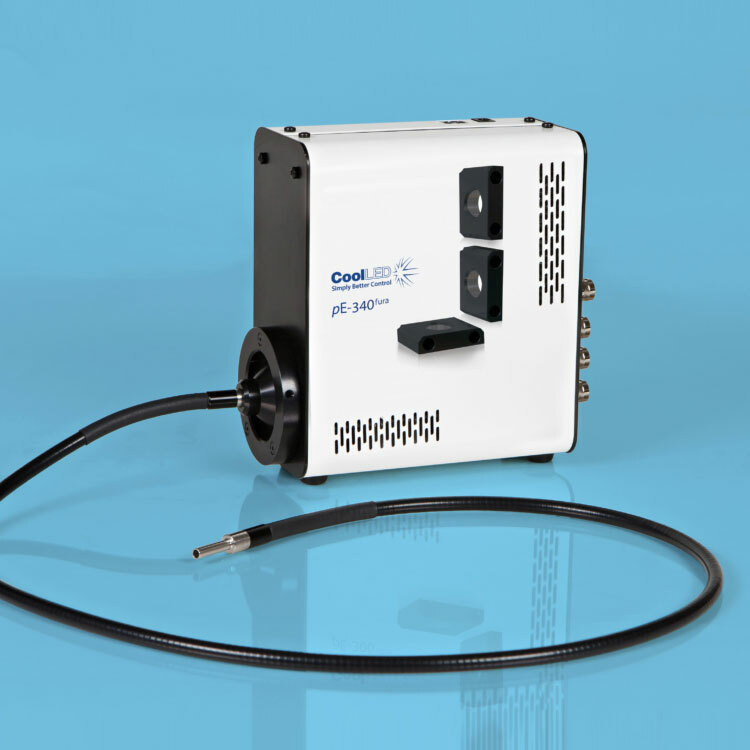 It can be specified with a microscope adaptor for direct fit configuration or with a 3mm diameter liquid light guide if there is a need to keep the source of illumination remote from the microscope. 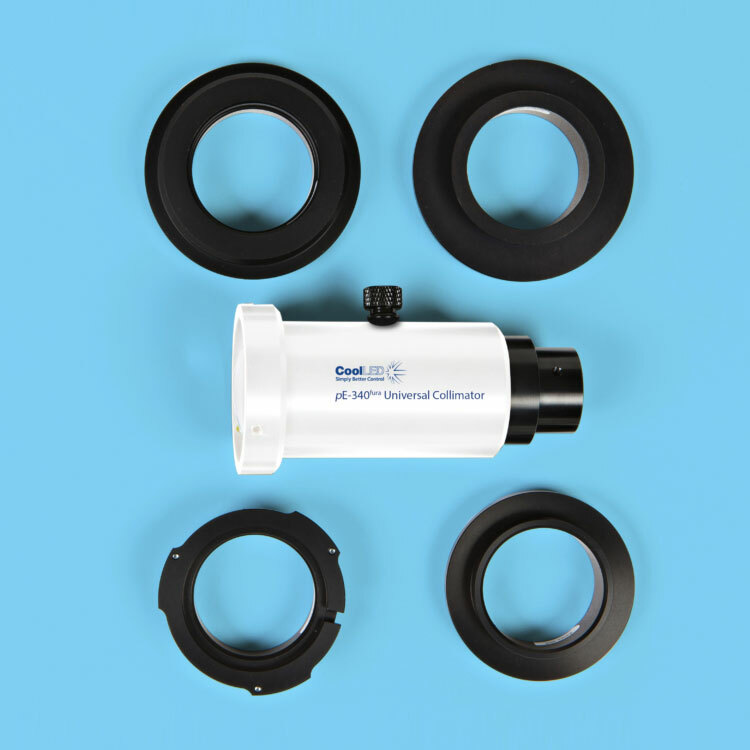 An optional pE-Universal Collimator and microscope adaptor can be selected for use with a liquid light guide. 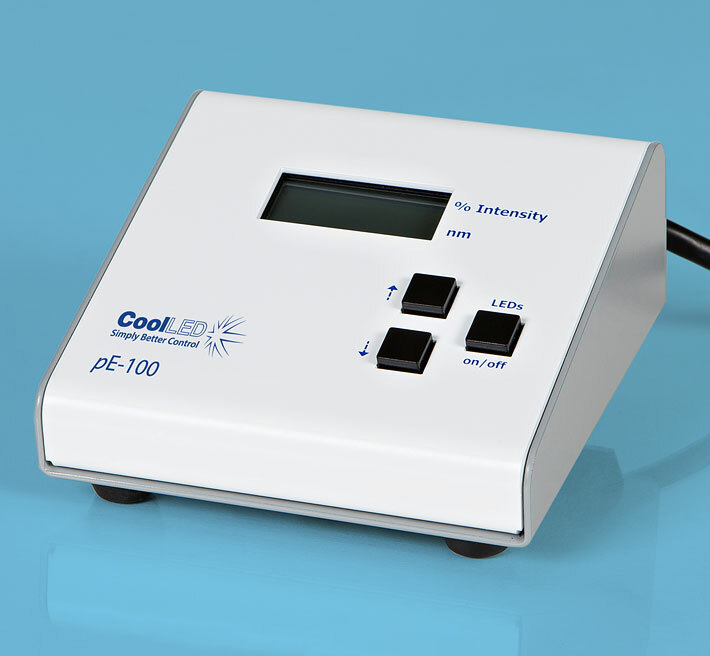 A benefit of the pE-300ultra is that stains can be viewed either individually or in combination, without filter cube changes. 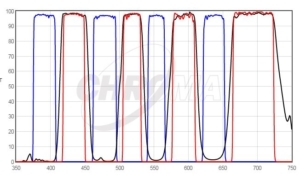 This makes it ideal for use with multi-band filter sets as the screening process can be simplified when fewer filter cubes are used. 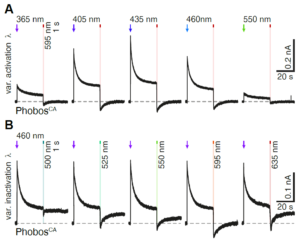 Independent control of the three LED channels means that the user can control the level of excitation of each fluorescent stain independently on a multi-stained sample, potentially removing the need for single band filter sets altogether. 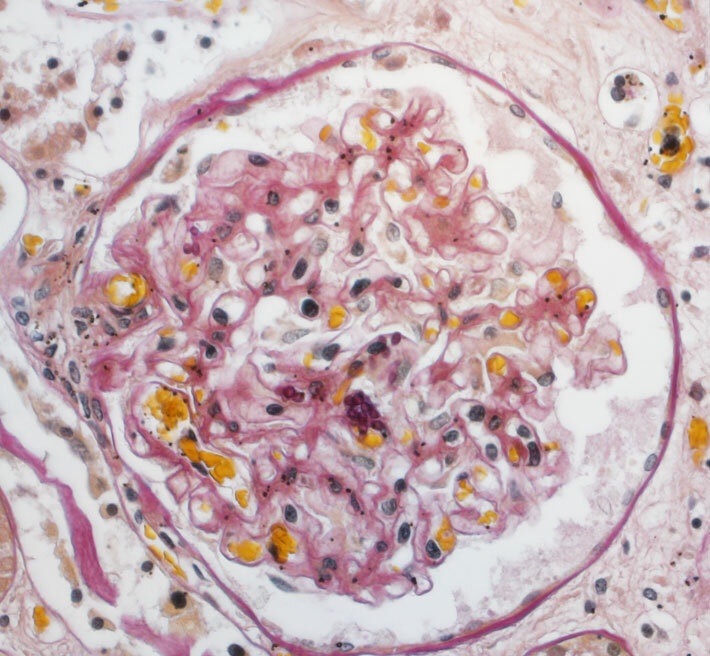 For further information on improved multi-stain testing, go to the Downloads tab. 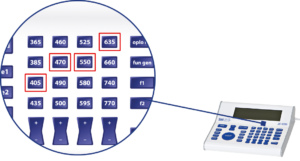 An important additional feature of the pE-300ultra is that it includes CoolLED’s “Sequence Runner” multiple channel excitation mode. 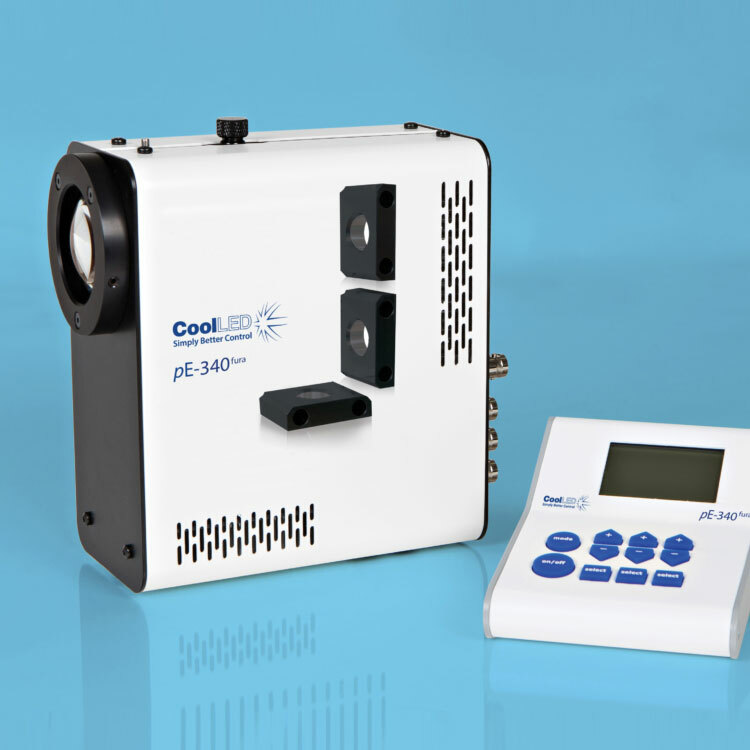 Users can define the order of their fluorophore capture using their pE-300ultra Control Pod, then the pE-300ultra light source can accept a single TTL output from the experiment set-up’s camera to initiate the step-through of a sequence of excitation channels. 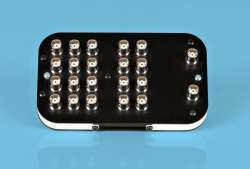 This feature is independent of the individual channel TTL inputs on the light source. 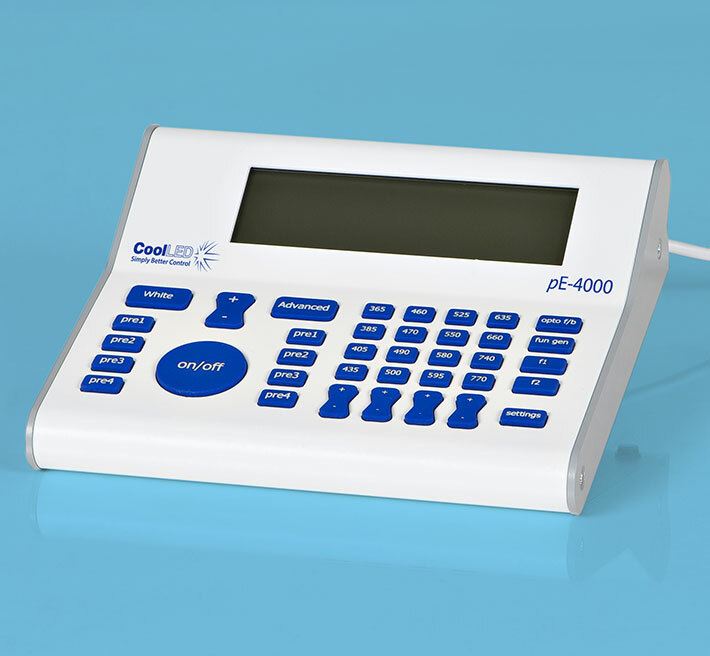 This offers users the facility to run through a sequence of excitation channels using a camera which has only a single TTL-out. 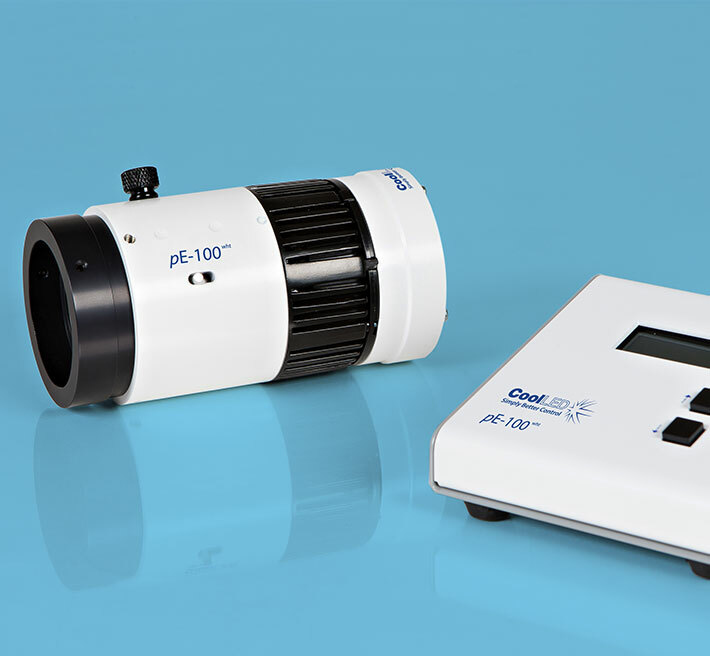 With an expected lifetime in excess of 25,000 on hours and a comprehensive range of microscope adaptors, the pE-300ultra can be fitted to most current and older microscopes and operate for many years without aligning or replacing bulbs. The result is a safe, convenient illumination system without any additional operating costs. Liquid Light Guidewith a fixed 3mm diameter, liquid light guide. 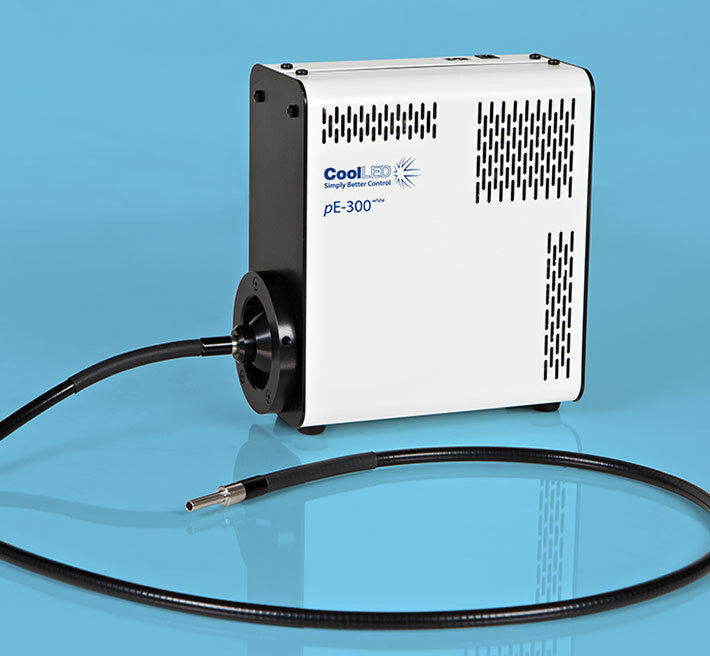 An optional pE-Universal Collimator can be specified in conjunction with a microscope adaptor if required. 광량 조절은 1 % 단위로 1 ~ 100 % 까지 설정이 가능하다. 다양한 현미경 제조사의 모델에 적합한 아답터를 선택 할 수 있음. 라이트 가이드를 이용하여 광원을 전달이 가능합니다. 다만 , 이러한 경우에 광량 손실이 발생하므로 이를 고려하여 제품을 구성 하여야 합니다.